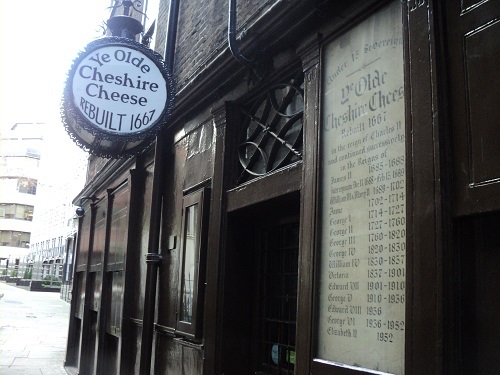 If there was a competition for the most famous pub in London, Ye Old Cheshire Cheese would be one of the prime candidates. Rebuilt shortly after the Great Fire of London of 1666, it has become associated with most of the great literary figures of London. 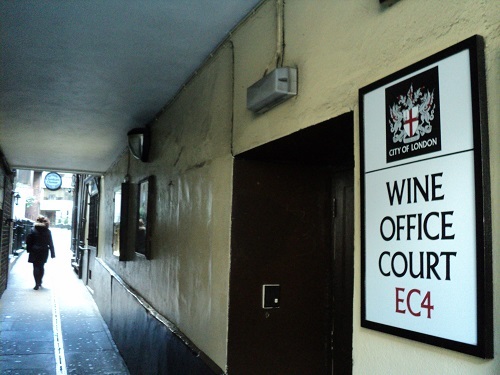 Its greatest association is with Doctor Johnson who lived in nearby Gough square, but it also been frequented by Oliver Goldsmith, Charles Dickens, Alfred Lord Tennyson, G.K. Chesterton amongst others. 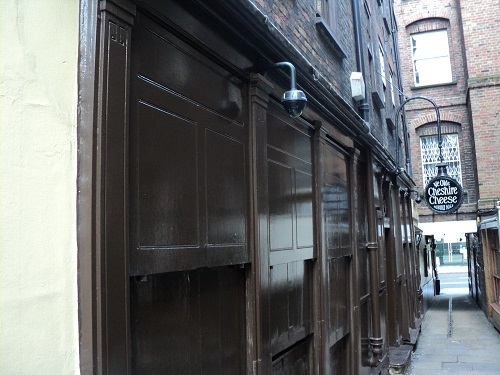 It was the location of the Rhymers Club in the 1890s which included Yeats and Oscar Wilde amongst its members. In 1907, a visiting Mark Twain was appalled at his fellow Americans flocking to the pub as a shrine to Dr Johnson.As he sat in the Doctor Johnson room at the Cheshire Cheese he remarked. His friend Bram Stoker of Dracula fame gently mocked the American by saying “Read Johnson plentifully, I suppose,” knowing that he had never read any of his works. The pub’s fame has seen it regularly visited by a wide number of famous people of the decades, and is a tourist attraction in its own right. In the 1920s one of its most famous patrons a grey parrot called Polly died, this event was reported in hundreds of newspapers of the time. Polly’s fame was such that the bird was stuffed and put on display at the pub. 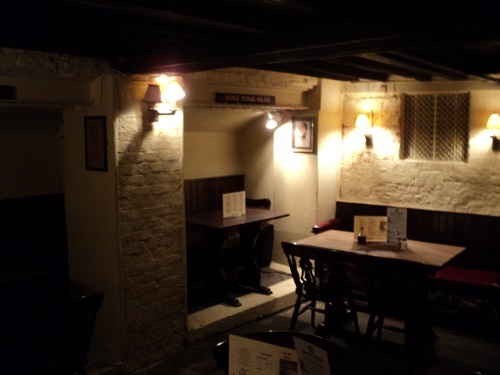 More recently the pub is the location for the American children’s book The Cheshire Cheese Cat by Carmen Agra Deedy, Randall Wright and Barry Moser. A more adult themed history was revealed in the 1960s when a number of sexually explicit tiles were found in an upstairs room, dating from the mid- eighteenth century it suggests that the room may have been used as a brothel. The tiles were donated to the Museum of London. 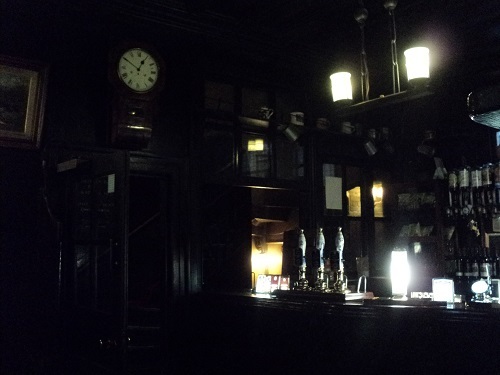 The pub looks uninspiring from the outside but is a maze of small rooms and alcoves whose dark wooden panelling and smoky atmosphere from open fires transport you back in time. It was also made for visitors of a smaller stature, so beware banging heads on low beams on stairs and doors if you are above average height. 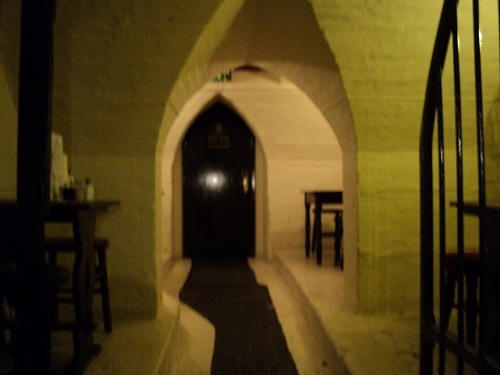 If the pub is old, it has been suggested that some of the vaults underneath the pub are part of 13th-century Carmelite monastery. 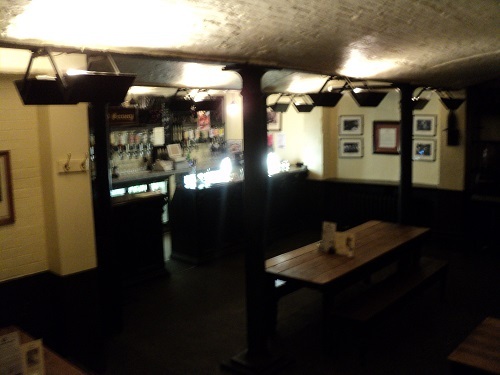 Famous for being a Chop House over the centuries, food is still served and the Beer is relatively cheap by London standards brewed by the Samuel Smith Brewery. By londonvisitors2014 in City of London, Pubs of London on February 8, 2014 . Thanks for the memory, I bet he never did that again !! !